Hurry Free Shipping Ends 30 April! The weather is headed towards winter and we’ve had to add jackets and jumpers to the start of the day this week. There is only 1 day left to take up our Free Shipping offer when you purchase $99 with Made For School. It’s easy to get all your Winter School Uniforms Online at Made For School as we’ve can keep you warm from your head to your toes. Check out our massive range of smart, classic and comfortable winter warmers. We’ve got beanies, scarves, tights, socks and everything in-between. Our school shirts and skivvies are always popular in winter and our range of fleecy jumpers and track pants means the kids can stay warm no matter what Mother Nature throws at them. 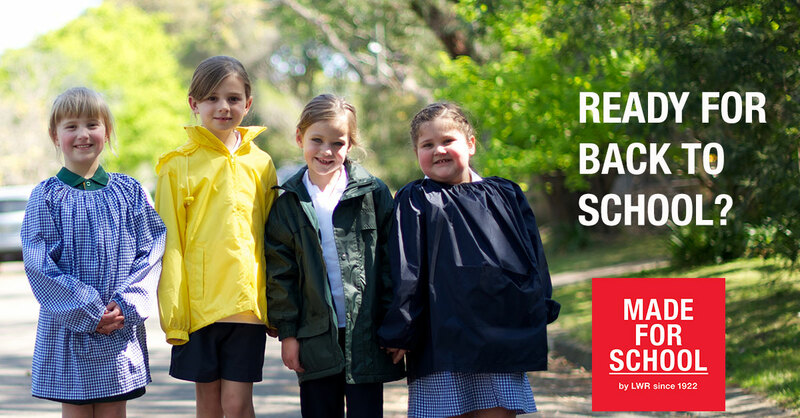 Remember there’s no such thing as bad weather just bad clothing so dress your kids in the best this winter and order their school uniforms online with Made For School. Anzac Day is a day of remembering and honouring all Australians who have served and died in war or whilst serving our country. The spirit of the Anzac lives on through the many stories we share through the generations and indeed in our service men and women today. 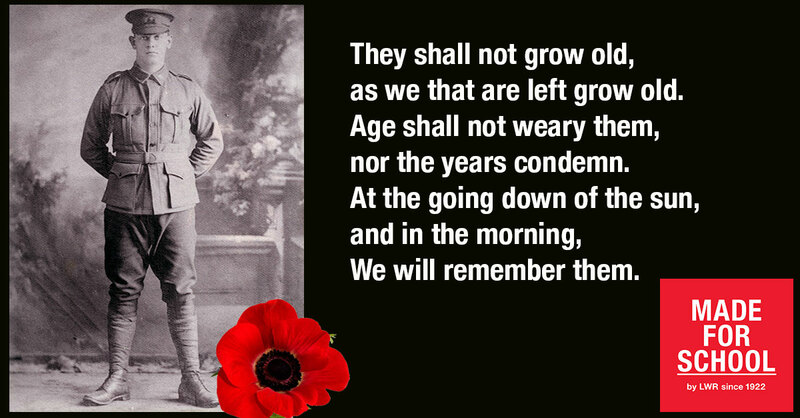 The Anzac qualities of courage, sacrifice and mateship continue to be woven into our national identity and today we honour those who have served and those who have sacrificed for our freedom and the Australian way of life. Our Great Uncle, Leslie Winter Reid served in the Australian Army in the first world war before returning back to Australia and starting up our family business, LW Reid. Today, we continue to work with the values that Leslie established the business with; quality and service above all. Today as families remember those who have served and those who paid the ultimate sacrifice, we will remember Leslie Winter Reid and the many other family members who have helped shape our nation and protect our freedom. We’re enjoying the final days of the holidays and are gearing up for term 2, I don;t want to be caught on the hop with the change of seasons! This weather has been sensational but with term 2 starting for us on Wednesday I am more than aware that Jack Frost is coming along with foggy starts, minus temperatures and warmer clothes are a must! We need more than a few layers to keep the kids warm and snug for school and the sidelines, but I’m amazed that my kids have managed to grow a foot in 6 months. We’ve enjoyed the late start to the cooler weather and have managed to get all the winter uniforms ordered, delivered and washed while the sun is still giving some warmth. If you’re yet to embrace the change that’s coming then I say stay outside and enjoy the weather while we take care of all the kid’s uniforms. 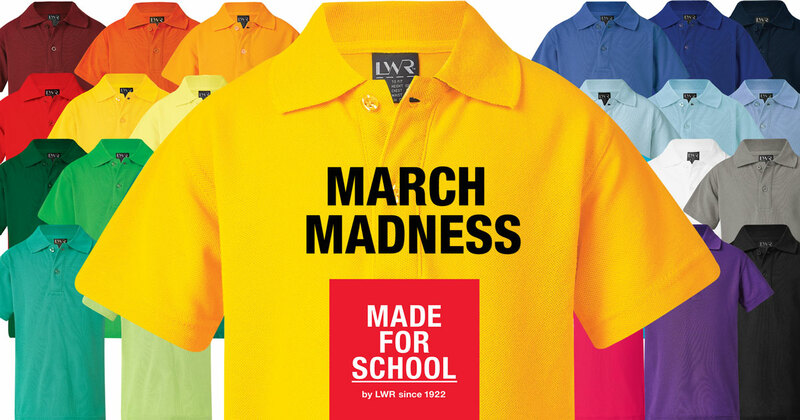 Enjoy Free Shipping for all your school uniforms online with Made For School when you spend $99 in April. There’s never been better weather or a time to gear up for the change of seasons. Head over and check out our great Cheap School Uniforms as well as all your winter schoolwear and more. We’ve got everything you need from Beanies and Scarves to Skivvies, School Shirts, Sports Shirts, Jumpers, Vests, Jackets, Track Pants, School Pants and more. 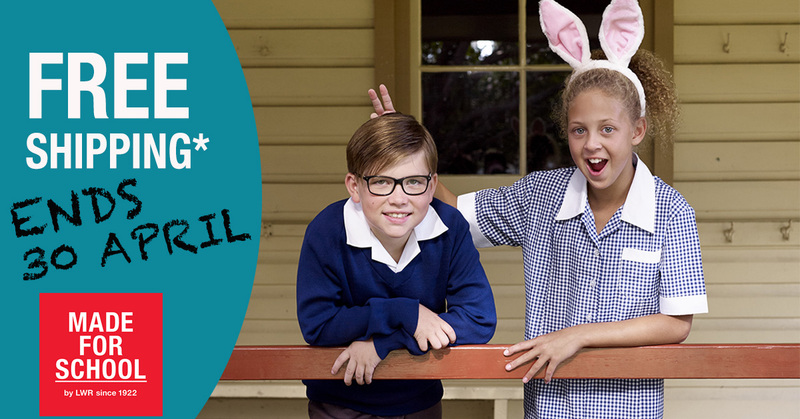 Don’t be left on the hop this month, shop school uniforms online today and we’ll deliver it to your desk or door so you’re set for the last month of autumn next week. 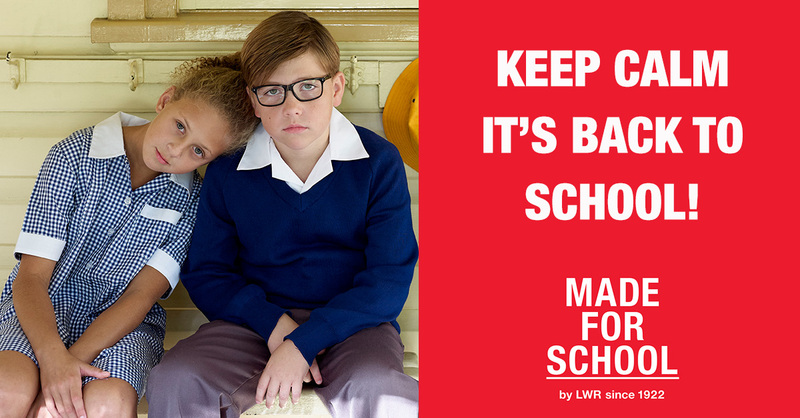 At Made For School, we’ve gone a little mad, but it’s all good news for you. For the month of March, you can get 10% off our Classic Higgins Polo Shirt. This long time favourite polo is available in 25 colours and sizes 2 to 4XL so there’s a shirt for Harmony Day, school and play. Don’t miss out on this madness it can only last for March! The excitement of the kid’s swimming carnival is consuming our house. They are madly practising their house chants and ensuring they have everything in red for the big day on Friday! 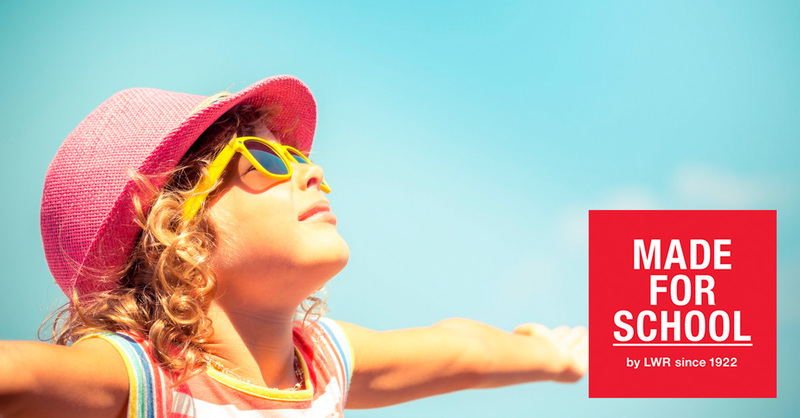 At Made for School, we make sure you’re covered for every school event, from excursions to camp, to sports uniforms and house colours so our gear is Made For Carnivals as well. Over the past few years of carnivals, I have learnt a few things that have made the day a little easier. 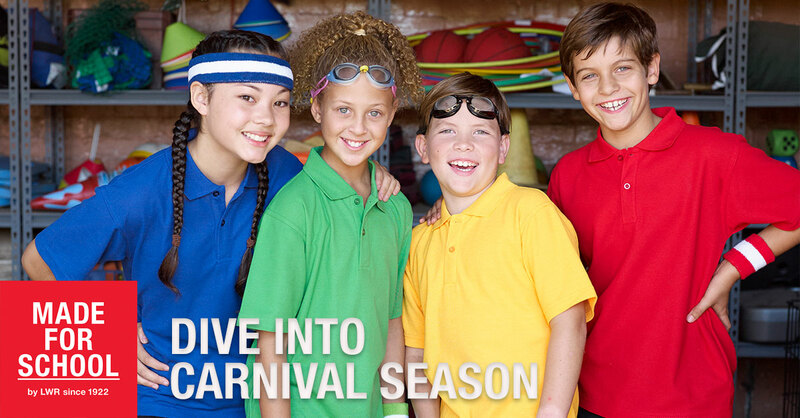 Swimming carnivals provide the most challenge because the kids need to change at some point. Our Petrie Waterproof excursion bag is perfect for keeping things dry so I pack one for each of the kids to put their wet swimmers in. We are all red in our family but no doubt that will change for high school. Red works well for us as I’ve kitted the kids out in their favourite red gear. Miss 10 loves the Wylie T-Shirt, it’s so soft and easy to pull off and on as her races are called. Master 8 prefers our classic Higgins Polo and I enjoy the added protection on his neck when the collar is flicked up. Both of these shirts are available in lots of house colours and are made from UPF rated fabric so they love the carnivals as much as the kids. Master 8 can’t move past the Richards Rugby shorts, they are his favourite. The drawcord waist keeps them where they are meant to be and the zippered pocket means he can have some tuckshop money for after his race. Miss 10 can’t decide between the Lee Skirt and the Ross Microfibre Shorts. Both of these are so comfy for sitting by the pool but I’m going for the shorts as they will keep a little more of her legs covered on the day. This year Master 8 will be wearing our Baker Microfibre Legionnaire Cap as I know he is bound to get up to some water flicking during the day and this new cap can handle a few splashes. Miss 10 will be wearing her favourite, the Gosse Microfibre Bucket Hat because this hat can cope with the many varied hairstyles that she comes up with. Now that I’ve got their gear sorted and they have their chants, the only thing left is to practice diving and strokes so they can have a great time at the carnival on Friday. Are you ready for the carnivals? Week 2 has started for us and I must admit last week was a struggle. Adjusting from 6 weeks holiday straight back into the school routine has taken its toll. As much as we were organised with school uniforms, routines and a stocked freezer I didn’t do any mental and emotional preparation and that was evident at the end of the week. Come Friday afternoon we had exhausted kids and one Mumma who was on the brink of a meltdown. Smiling Mind is a great mindfulness app which we use infrequently with the kids. Last week, ABC and Smiling Minds shared a great mindful meditation to help our kids tune into their emotions. Mindfulness is a great tool for all of us in a busy switched on world and this meditation is one you can do together as a family. My aim this week is to be mindful and start the day positive and focused with the aim of changing our Friday afternoon up. So this week I will practise this meditation with the kids a couple of times and see if we can identify emotions and stay present rather than getting carried away with large emotions at the beginning of another school term. Do you practise mindfulness in your family? It’s the first day of term 1 for us and many other families in NSW and around Australia. While I’m reluctant to go back into the routine, I am ready for the kids to head back into the classroom for another year of learning, discovery and growing. My kids have mixed feelings about a new year and indeed today. Who will their teacher be and who will be in their class? My main concern is will they bring everything home and survive the first day of school in nearly 40-degree heat? We have everything ready and today I will try and remember to capture their annual photo by in our doorway so we can see how they grow and change over the years. I’m sure I’ll struggle to get back to a quiet house and will fall into the trap of looking for them more than once. 3:10 pm will come around all too quickly and once again we will back in the swing of another school year. If the kids come home without a hat or worse don’t forget our Free Shipping ends on 31st January so jump online and grab the extra supplies. We wish all the kindy and year 7 families, a successful transition to big school. For all the families with kids returning to school, stay strong and enjoy the routine for another year. Class of 2017 Are You Ready? 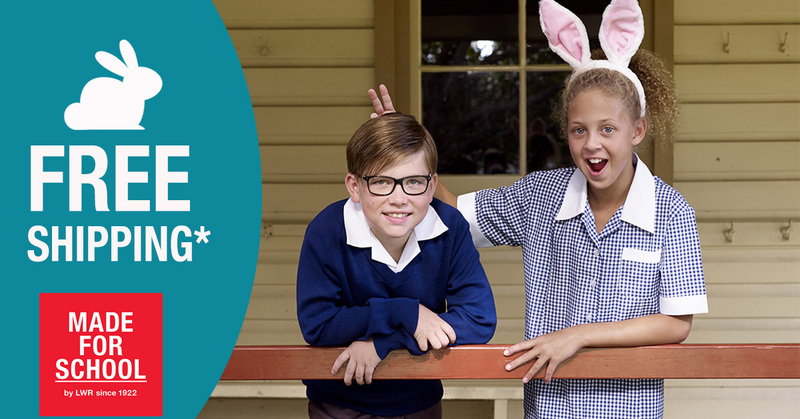 Queensland families are the first to kick the school year off as term 1 starts for them today. The rest of the country has a staggered start, but for us, next Monday is fast approaching. We’re at that stage in the holidays where the kids need some extra challenges and more people to play with. I’m ready to send them back but also reluctant to start the year because it means back into the routine and another year will soon fly by! This week I will be focusing on getting back into the routine, writing out our lunch menu ideas, so lunchboxes don’t become stale by week 3 and finalising all of the school uniforms. While it’s still in the 30’s, we are very used to a quick chilly change in the next 2 months, so I’m going to make sure we have uniforms to cover term 1’s weather and activities. 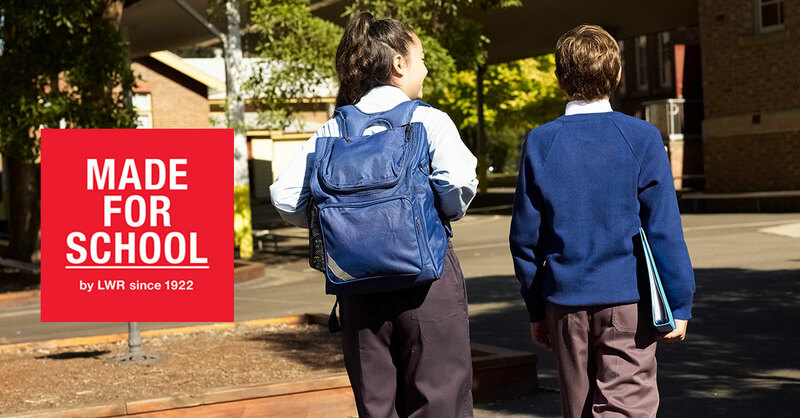 There is no better time to set yourself up for term 1 and beyond with school uniforms because all orders over $110 receive Free Shipping when you purchase your school uniforms online with Made For School. Term 1 always has a long start as we all get back into the routine. That often means that things go missing and the first thing to take an excursion in our house is the kid’s hats! Our winning hat is the Gosse microfibre bucket hat. It’s soft, squashable, washable and the crown cord holds it firmly on Miss 10’s head no matter what hairstyle she has. I’m also going to get a couple of lightweight jackets for when the cool afternoon and morning breezes begin. Sure it’s not likely to happen anytime soon but it seems to catch me off guard every year, not in 2017! Free Shipping means you can have all your uniforms sorted in a matter of minutes. Jump online and check out our extensive school uniform range. We’ve got you covered from head to toe with hats, polos, shirts, skirts, shorts, skorts, pants, jackets, jumpers, socks, bags and more! While you’re there be sure to check out our clearance items and bag a bargain as well. Enjoy the last week of the holidays and get ready for term 1 and enjoy Free Shipping on all orders over $110. We’ve got 2 weeks left of these holidays and I can’t believe how fast they have disappeared. We’re yet to hit the “I’m bored” stage and we’ve only managed to tick off a few things from our bucket list. With the countdown to school starting, I’ve decided to pull my head out of the sand and get the house and kids sorted for the return of routine. The easiest part of back to school preparations is ordering the school uniforms online. If I order by midday during the week, my parcel gets dispatched the same day. At the moment you can also enjoy free shipping when you spend over $110 in one order, which is easy to do since my kids have sprouted up over summer. Miss 10 needs some skorts, polos and our favourite jacket in a bag for when the showers hit at 3:10pm. Master 8 is after his favourite sports shorts and his smart cargo shorts as well as more polos and a new hat because that managed to land in someone else’s this year. Our library bags are still going strong after 5 years and I think with their years they will no longer need the art smock, but who knows? It’s nearly time to pack the backpacks and my essentials are always sunscreen, tissues and hand sanitiser so we will be stocking up. Thankfully the school uniforms will be delivered to our door because this heat means we are inside for some cooling down before there’s another meltdown.This year the kids will both be in primary school so I’m beginning to think about ways to get set up so homework is a breeze rather than an argument. 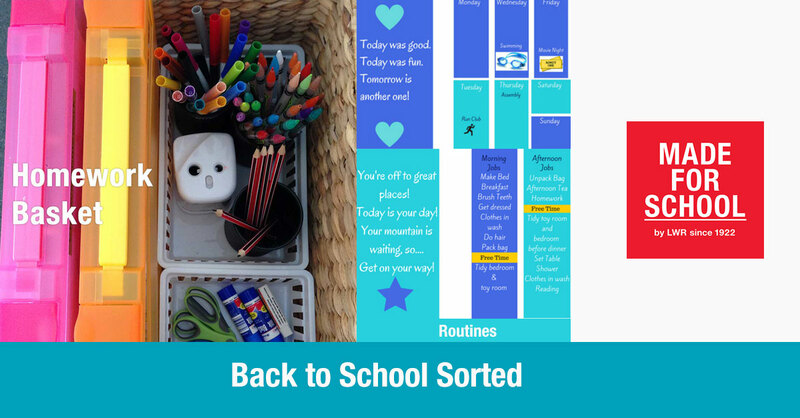 Our homework basket has helped us get homework sorted for the past few years so it’s time to replenish the supplies and be ready for another year to begin. Next week we will be getting back into school routine with the kids hitting their pillows closer to their school night times. We’ve enjoyed late nights quite a lot these holidays. But the heat and being tired has led to a few moments when emotions run wild and we’re not at our best and I’m not just talking about the kids. My kids, well really it’s me who loves routine. The predictable pace and moments throughout the day and week all mean we know what we’re doing and what to pack for the day. This year I will be revamping the kid’s routine charts as they help Master 8 to stay on track and Miss 10 to know what to pack in her bag. I think the only thing left for our back to school to be sorted is the baking. Miss 10 and I will be trying out some new recipes this week so we can mix up the lunchboxes a bit because come week 4 I’m tired of ham and cheese sandwiches. We’ve got some great recipes which freeze beautifully so we’ll be making those and filling the freezer with some goodies for term 1. If I get everything sorted this week then the next week we can tick a few more things off our bucket list and enjoy the final week of the holidays. There’s never been a better time to stay at home and order your school uniforms online with Made For School. We’ve got over 1.2 million items in stock, so we’re bound to have your colour range for school, sport and play. Our Free Shipping for all orders over $110 makes buying your school uniforms online easy and hassle free this year. We’ve been clothing Aussie kids for over 90 years, so we know a thing or two about making great gear that is kid proof. Our products are quality tested on our kids every day, so you don’t have to worry about how they will last because they will. I love nothing more than the lazy, slow rhythm of school holidays so if you’re like me, you’d prefer to enjoy time with the kids instead of dragging them around the shops for hours. Our size guide helps you to ensure you get the right fit every time when your buy your school uniforms online from Made For School. So what’s in a kit? Everything your child needs from head to toe and more! Choose a hat that suits your child and school policy and move on down to choose from our great range of polo shirts and school shirts. Next, choose your bottoms to coordinate with your uniforms. We’ve got a range of skirts, skorts, and shorts for our girls and some great shorts and pant options for your boys. Of course, a uniform is not complete without a great pair of socks and our Howitts are available in 7 different colours. Our accessory range will get the rest of your school kit sorted, so you’ll just have to fill the bag. We’ve got 2 great back pack options. Our Kennedy is great for primary school kids while our Hume does a great job for high schoolers and busy parents tackling all the after school activities. We’ve got a great range of library bags from our waterproof Lawson through to our Furphy calico library bag. These bags will save you money and heartache in library fines this year. Have you got the kid’s kits sorted for 2017 yet?